In an effort to prepare students for a future dominated by technology and innovation driven careers, Central Coast Grammar School (CCGS) has been incorporating more digital technology learning into its curriculum. Website design and coding, custom Fitbits and App development are all explored, with the skills learnt in each component designed to extend and enhance the previous. “Starting with the fundamentals of website design, students are taught the two core technologies for building webpages; HTML and CSS coding. “Learning HTML provides the tools to create the structure of the webpage, while skills in CSS gives students creative licence to experiment with different page visuals such as colours, logos and fonts. “The result is a fully functioning website landing page designed and coded entirely by the student,” Low said. 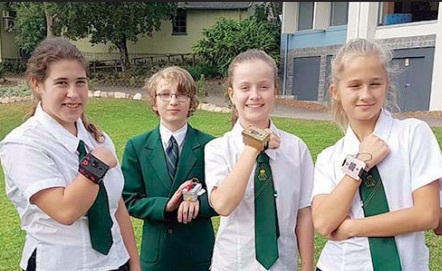 Students then take on the task of custom-made Fitbits, where over fi ve weeks, they use Python software, the same used by developers at Google, to program a series of tasks such as step counting, fi tness goals and coding motivational messages into the interface. The final part of the course sees students use the software App Inventor 2 to plan, code and build an App. Head of Computing at CCGS, Janine Comber, said the program provides a unique opportunity for students to learn skills that are relevant both in and outside the classroom. “In our ever-changing technological landscape, it’s vital that we enhance student understanding and capacity using digital technologies. “That’s why we’ve specifically designed a program that exposes students to learning, centred on the very latest technology. “This year, we’ve grown the program from one lesson to six per fortnight as a course within the wider Technology curriculum. “The additional time dedicated to the development of these skills has seen a huge difference in the learning outcomes for our students,” Comber said. “Year 7 is the optimal time to introduce this program to students as it builds on the foundation skills learnt in the junior years while also introducing concepts and study pathways they might not have thought about for their senior school years and beyond,” Comber said.